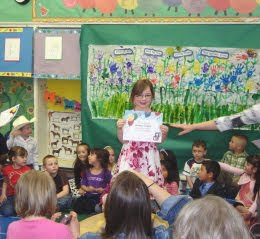 Delaney's graduation from Head Start! Our sweet little five-year-old princess graduated from Head Start on Thursday night and the school held a ceremony for the class. Delaney is here on the podium proud as can be with her certificate. The hand coming out of nowhere from the right is one of the teachers helping kids bring the diploma down from their face. Every kid posed with it covering their face making pictures a bit difficult! Delaney chatting up some of her girlfriends before the graduation. Delaney and her friends. Very cute. The girls sang us songs and the teachers read them the story they all wrote together. Mommy and her little graduate. Daddy and the girls celebrating in the cafeteria afterward. 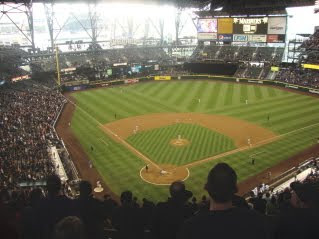 We decided to take a trip to an M's game on Wednesday (Delaney missed a day of school, please don't call CPS on us). It was an afternoon game family deal. As you can tell, the roof was closed as it was cold and pouring rain. Great game though. We were down 4-1 until we rattled off four runs in the bottom of the eighth to win 5-4. The girls didn't care, they were more concerned about getting mustard on their clothes. Adelyn is also in a phase (I guess) of licking the salt off of peanuts and placing them back in the bag. It's...endearing? Tons of people leaving the game, very crowded...a great place to run around and rough house! This is Delaney's friend Hunter from school. 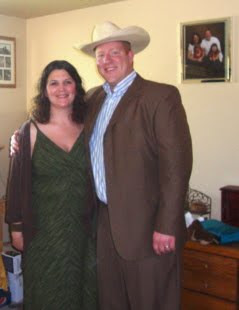 Depending on the day, Hunter is Delaney's friend, best friend, boyfriend or husband. He lives about three blocks away and will be going to kindergarten with Delaney next fall. He was over for a visit the other day. 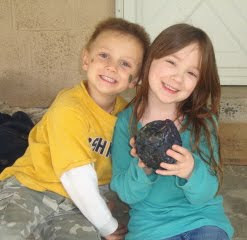 The kids made dinosaur eggs at school and Delaney hadn't opened hers yet, so they opened it together. The dinosaur egg hatched a...baby dinosaur. I think Delaney has a "...mom, you're embarassing me!" kind of look here. 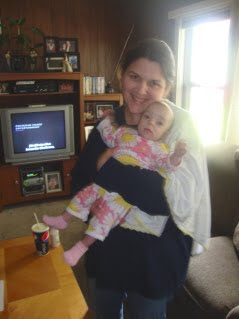 Brittany with Kaia, who like every baby seems to totally change every time we see her. Lyndsay, Kaia and Addy Bear. Logan had to get a look at the powerplant under the hood of Old Wilson. We found some other opportunities for improvement, which included headers, a higher performance carb and a lift kit. Date night at the Minor Wedding! After finally deciding the weather wouldn't make any last minute changes back to frigid nights, we decided to start planting our garden. We had already planted the tomato and strawberries in our Topsy Turvys, but we wanted to wait a while longer for the in-ground vegetables. 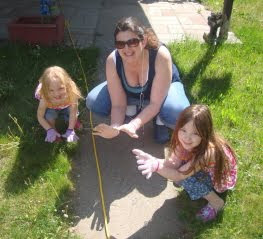 Just like last year, the girls were very much into helping with the garden. Here they are showcasing their gardening gloves with Mommy. Very excited to garden with Daddy, too. I was in the middle of using our weed eater, so that's why I'm wearing my goggles and my wardrobe was...less than stellar...although I'm proud to say I am a CWU Wildcat FANatic! Pulling weeds together. Wearing matching tank tops. My cute gardening princesses. 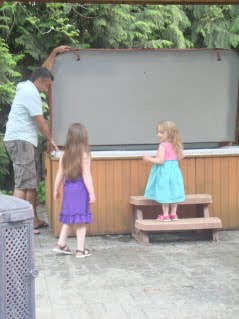 The girls don't get to see Uncle John as much as we'd like, but once they connected on Friday, he didn't disappoint, and neither did the girls. It took Delaney and Adelyn a few minutes to warm up to him, but they were connected at the hip for the night. John couldn't get over how big the girls have gotten, including their sassiness. Anyone who knows John knows he not only sings karaoke, but he brings down the house. He found a karaoke site online and he and Delaney put together a great complilation of songs. After a trip to the eye doc and exploring a bit of Seattle, we of course had to visit Dad and Sharon at "The Park," which of course the girls had been looking forward to all week long. 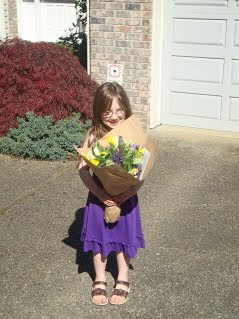 We didn't get to see Sharon on Mother's Day, so Delaney helped pick out flowers from one of the vendors at Pike Place Market. The purple and yellow arrangement matches Delaney's outfit perfectly. After dinner, the girls entertained us with their favorite songs, cheers and dances. Family photo of the girls with Grandma and Grandpa and Uncle John, who was up for a few days for Rob's birthday and to hang out. The girls love John, he was as much entertainment for them as they were for him. We headed over to Bellevue for another eye appointment for Delaney, so obviously we try and make it a fun day trip for the whole family. 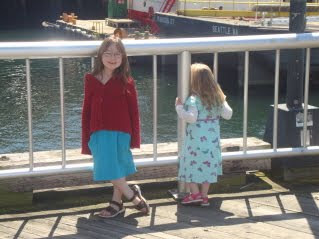 We decided to head to downtown Seattle and also the waterfront with the girls. I have great memories of Seattle from back in the day and it's important for me and Brittany to expose the girls to as much as we can just to show them how big and different the world can be beyond Kittitas. Oh, by the way, Delaney's eyes have significantly improved with this new method of patching her eye to strengthen her sight. Her vision is much better and Brittany, Dr. Preston and I were thrilled, as was Delaney. What was another great victory is her comprehension of letters and numbers. Delaney's known her alphabet for quite a while (and Adelyn is certanly getting most of it) but her ability to identify letters and numbers has exploded and that was on full display during many tests for her eye exam. So proud! The tooth fairy visits Delaney!